Get the Best Books of All Time - or Learn How to Write Them. As part of helping authors train themselves to write bestsellers, a project was begun to enable writers to study the all-time great fiction. Thus began the Midwest Journal Writer's Club. A first pre-step in this was to create a tool: "Becoming the Fiction Storyteller of Your Dreams." This book gives you little-known tools from Dorothea Brande and Marie Shedlock - which enable you to overcome writer's block and any non-writing inertia you may have stored up. These two then help you to learn how to tell a story which keeps a listener or reader rapt in their seat. The project we have started here is to re-publish (and make readily accessible) the top 50 bestselling classic fiction books, as determined by actual downloads from Gutenburg.org, Goodreads, and Feedbooks (with help from Wikipedia, too...) So far we've gotten a year's worth (26) of books onlines to our distributors. We will also be producing trade-paperback editions as well as study guides for each book on Lulu, which will have the original text, plus ample margins for notes, spiral bound on full letter-size pages for ready study. The idea is to enable ready study of these books by anyone. An accompanying emal course will follow in turn, giving you access to versions of each book, one every other week for a year. Right now, we are launching this quietly, while we assemble the digital masters, edit them into shape, and publish into the various formats. Stay tuned - sign up for the free review copies in the upper left so you don't miss out! They're letter-sized printed pages with spiral bindings. We take the same text you'll find in the epub/ebook/paperback version and format it for easy reading. It starts out as a trade paperback format, and then gets extra margins added so you can put notes on the sides, or add tabs, and still be able to read the text. (And dog-earing the pages is perfectly acceptable, too.) This expands it to letter-sized pages. The text is still readable as it was originally. Next, we put it in a spiral binding so that you can flip it over backwards. This way, you can take it to a coffeeshop and not have to wrestle the pages around on those tiny bistro tables. The printing is done by Lulu on quality paper, so it can take a lot of wear and not give out. Figure that you can now put it in a knapsack or briefcase, or shopping bag and it will last for many re-studies. A sample is shown to the left. As we can, most all of the books will get this treatment. Unfortunately, this is exclusively found on Lulu, not Amazon. Some of these longer Writers' Club Selections will take some work, since Lulu has maximum page-counts possible to be bound this way. (Consider "War and Peace", "Les Miserables", and some others...) Meanwhile, the plan is to have these available as PDF's so you can print them out yourself. Trade paperback versions will follow shortly, and these will port to Amazon. Use the contact form to tell us about it (or leave a comment on one of the many blogs connected to this site.) If it's a digital version, we'll fix it and email you a new version. Check out "Just Publish! 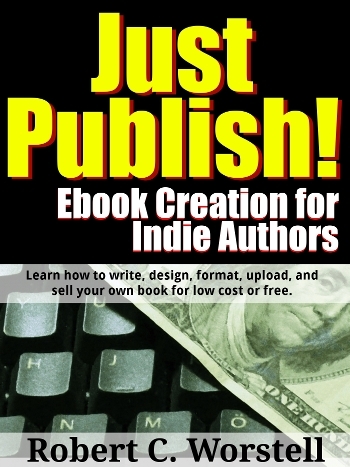 Ebook Creation for Indie Authors." and Spiral-Bound Study Guide with Note-ready Margins. The story begins in 1815 in Digne, as the peasant Jean Valjean, just released from 19 years' imprisonment in the galleys—five for stealing bread for his starving sister and her family and fourteen more for numerous escape attempts—is turned away by innkeepers because his yellow passport marks him as a former convict. He sleeps on the street, angry and bitter. ...Some time after sailing, Ahab finally appears on the quarter-deck one morning, an imposing, frightening figure whose haunted visage sends shivers over the narrator. One of his legs is missing from the knee down and has been replaced by a prosthesis fashioned from a sperm whale's jawbone. The Call of the Wild is a novel by American author Jack London published in 1903. The story is set in the Yukon during the 19th-century Klondike Gold Rush—a period when strong sled dogs were in high demand. The novel's central character is a dog named Buck, a domesticated dog living at a ranch in California as the story opens. Stolen from his home and sold into the brutal existence of an Alaskan sled dog, he reverts to atavistic traits. Buck is forced to adjust and survive cruel treatments, fight to dominate other dogs, and survive in a harsh climate. Eventually he sheds the veneer of civilization, relying on primordial instincts through lessons he learns, to emerge as a leader in the wild. ...An adventure story primarily concerned with themes of hope, justice, vengeance, mercy and forgiveness, it focuses on a man who is wrongfully imprisoned, escapes from jail, acquires a fortune and sets about getting revenge on those responsible for his imprisonment. However, his plans have devastating consequences for the innocent as well as the guilty. The poem tells of Dante's journey through the three realms of the dead, lasting from the night before Good Friday to the Wednesday after Easter in the spring of 1300. The Roman poet Virgil guides him through Hell and Purgatory; Beatrice, Dante's ideal woman, guides him through Heaven. Beatrice was a Florentine woman whom he had met in childhood and admired from afar in the mode of the then-fashionable courtly love tradition, which is highlighted in Dante's earlier work La Vita Nuova. Sir Charles Baskerville, Bart, is found dead on the grounds of his country house, Baskerville Hall. The cause is ascribed to a heart attack. Fearing for the safety of Sir Charles's nephew and the only known heir, Sir Henry Baskerville, coming from Toronto, Canada to claim his inheritance, Dr James Mortimer travels to London and asks Sherlock Holmes for help. James "Jim" Hawkins, is the young son of the owners of the Admiral Benbow Inn. An old drunken seaman named Billy Bones becomes a long-term lodger at the inn, only paying for about the first week of his stay. Jim quickly realizes that Bones is in hiding, and that he particularly dreads meeting an unidentified seafaring man with one leg. Dorothy is a young orphaned girl raised by her Uncle Henry and Aunt Em in the bleak landscape of a Kansas farm. She has a little black dog Toto, who is her sole source of happiness on the dry, grey prairies. One day the farmhouse, with Dorothy and Toto inside, is caught up in a cyclone and deposited in a field in Munchkin Country, the eastern quadrant of the Land of Oz. The falling house kills the evil ruler of the Munchkins, the Wicked Witch of the East.